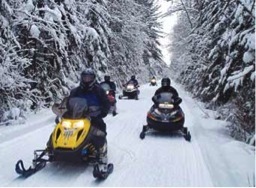 Michigan snowmobile trails and the cozy all-season cabins along the trails are a great combination. Park, sleep and ride the Snow Belt’s 180 inches of snow. Michigan snowmobile trails are some of the best in the nation. The Snow Belt in Michigan produces almost 180 inches of dependable snow every year. That is a dream come true for ideal Michigan snowmobile trail conditions. The Bergland to Sidnaw Route is a terrific snowmobile trail in the Upper Peninsula of Michigan. This 43 mile trail is a very scenic and gently rolling trail that traverses east and west parallel to the very beautiful M-28 through 5 different bridges worth exploring. Another popular trail is the 62 miles North Central State Trail that begins and ends in charming small tourist towns. Ride the trail all the way to Lake Huron! Once you see Lake Huron, turn and get on the North Eastern State Trail in Cheboygan that meanders through scenic towns in Presque Isle County.